There is growing evidence that optimally performed two-stent techniques may provide similar or better results compared with the simple techniques for bifurcation lesions, with an observed trend towards improvements in clinical and/or angiographic outcomes with a twostent strategy. Yet, provisional stenting remains the treatment of choice. Here, the author discusses the evidence – and controversies – concerning when and how to use complex techniques. Double-stent techniques are difficult, 1 more complex to perform than single-stent procedures, thus the outcomes are more operator dependent. Most studies on currently used stents have revealed an increased risk of periprocedural MI with two-stent techniques,2,3 in comparison with simple procedures, while being equally effective, and safer than complex ones. These issues provide a potential role for dedicated bifurcation stents. These devices must be easy to use, effective in various lesion morphologies and safe. Currently, different dedicated devices are used or being developed and classified according to different rules. A simple classification is based on the primary role of the stent, i.e. main branch stents (MBS), dedicated to treating the main vessel; and side branch stents (SBS), dedicated to treating and protecting the SB. MBS allows for both simple and complex strategies, as needed. This group includes the following devices: AxxessTM (Biosensors Europe SA), BiOSS® and BiOSS LIM® (Balton), Nile CroCo® and Nile PAX® (Minvasys), STENTYSTM (STENTYS SAS), Xience SBATM (Abbott Vascular), Twin RailTM (Invatec/Medtronic), TAXUS® PetalTM (Boston Scientific) and others. Contrary to expectations, most are not easy to use, require wide operator experience, and may themselves cause some devicespecific technical problems. Therefore, many of these devices have not entered routine clinical practice. A guiding catheter larger than 6F is necessary to implant the Axxess, Xience SBA, and TAXUS Petal stents, wire wrapping may make implantation of some devices (e.g. Axxess, Nile CroCo, Twin Rail, Petal) demanding, device self-alignment is often incomplete (e.g. Xience SBA, TAXUS Petal), and active, controlled rotation may be impossible (e.g. Xience SBA). The Axxess stent is a 150 micron-thick strut, self-expanding nitinol stent, covered with Biolimus A9TM (Biosensors International), a drug released from biodegradable polymer. According to MADS (main, across, distal, side) classification, the stent belongs to the M category (main proximal first), as it covers the only the proximal main branch (MB) up to the carina level.13 While recrossing into the SB is not necessary, this technique often requires additional implantation of one or two stents to treat the lesions located in distal MB and SB. The procedure itself requires experience and precision when nesting the device at the carina. In the AXXESS Plus pivotal study, device success rate was 93.5 %, and 80.9 % of the patients received additional stents.14 The overall rate of major adverse cardiac events (MACE) at 6 months was 11.2 %, with no cases of acute or subacute stent thrombosis (ST), although late ST was reported in 2.2 % of the treated patients. The recently published COBRA trial reported on 40 patients with true bifurcation lesions randomly assigned to treatment with the Axxess and additional BioMatrixTM (Biosensors International) stents or a culotte technique using XIENCETM (Abbott Vascular).15 Implantation of the Axxess stent resulted in a significantly larger lumen in the proximal MB after the procedure and at follow-up, and in a lower angiographic late lumen loss (p=0.05). Both strategies resulted in good clinical outcomes with a rate of 10 % MACE at 1 year. The other device within MBS group is the BiOSS stent, for which there are two types: the older, paclitaxel-eluting BiOSS Expert® (Balton) and sirolimus-eluting BIOSS LIM. Both drugs are released from biodegradable polymer. The stent was designed to respect the fractal geometry of bifurcation, hence the proximal region has a larger diameter than the distal (the proximal/distal diameter ratio is 1.15–1.3). Both regions are joined by two connecting struts (mid zone). The stent is mounted on a special stepped delivery Bottle® balloon (Balton). The balloon mid marker, which shows the mid zone, allows for adequate stent positioning. According to the MADS classification,13 the stent belongs to ‘A’ group (provisional stenting). Once the mid marker is positioned at the tip of the carina, the stent is fully opened and no or minimal carina shift towards the SB should occur. An SB stent may by implanted as needed in either the T/T with protrusion or culotte mode.16 The ease of use is the major advantage of the BiOSS stent, whereas the lack of the coverage of the SB ostium is a major limitation. 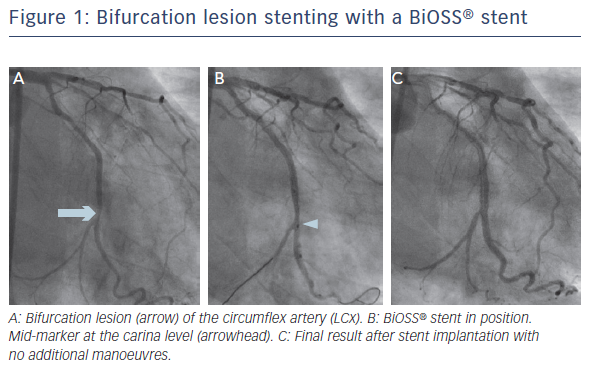 An example of bifurcation lesion stenting with a BiOSS stent is shown in Figure 1. In the POLBOS (Polish Bifurcation Optimal Stenting) I randomised study, the BiOSS Expert stent was compared with regular DES.17 A total of 243 patients were enrolled and randomised (1:1) to receive either treatment. Additional SB stenting was required in 10 % of cases in both groups. At 12 months, cumulative incidence of MACE was similar in both groups, but the target lesion revascularisation (TLR) rate was significantly higher in the BiOSS group (11.5 versus 7.3 %; p=0.02). In the POLBOS II study, patients were randomised to either the BiOSS LIM group (n=102) or to the conventional DES group (n=100).18 Contrary to expectations, SB stenting was required in a greater proportion of the BiOSS group (8.8 %) than the provisional group (7 %), but with no statistical significance. At 12 months, the cumulative incidences of MACE and TLR were similar in both groups: 11.8 versus 15 % (p=0.08) and 9.8 versus 9 % (p=0.8) for BiOSS LIM and DES groups, respectively. The BiOSS LIM stent was also examined in the prospective international registry enrolling 74 patients with distal left main stenosis.19 At 12 months, the rate of MACE was 9.5 % without cardiac death or definite stent thrombosis. TLR and MI rates were 6.8 % and 2.7 %, respectively. To date, no studies have shown a clear advantage of MBS-dedicated devices over provisional stenting with the use of conventional DES. Apart from the BiOSS stent, devices are not easy to use and require some extra device-specific skills. Another weakness of this technology is a limited range of device length, thus multiple stents may be required for implantation into the MB. The Tryton SB stent (Tryton Medical) is the most widely studied dedicated device. This is a thin-strut, cobalt-chromium bare metal stent, and consists of three zones: a distal, slotted-tube SB zone, for treatment and protection of the SB; a transition zone, to be positioned at the SB ostium; and an MB zone with two wedding bands and three undulating fronds minimising the amount of metal. The stent is mounted either on a straight or on a stepped balloon, to respect the fractal geometry of coronary bifurcation. According to the MADS classification, the technique with the Tryton SB stent belongs to inverted ‘A’ category (inverted culotte). An example of bifurcation lesion stenting with a Tryton SB stent is shown in Figure 2. The stent has been examined in multiple registries and in one large randomised trial. In a large E-Tryton 150/Benelux registry a total of 302 patients were enrolled.21 Technical and procedural success rates reached 98.0 % and 94.4 %, respectively. The cumulative 6-month MACE rate was 6.4 % with no deaths, 4.7 % MI events, and 3.4 % target lesion revascularisation events. Only one case of stent thrombosis was reported. Recently, the Tryton Confirmatory Study has been reported,22 a study designed to confirm the results of the post-hoc analysis of the TRYTON Pivotal trial. A total of 133 patients with bifurcation lesions containing large SBs (≥2.25 mm, confirmed by QCA) were enrolled. The primary endpoint was non-inferiority with regard to periprocedural MI as compared with the provisional cohort of the previous Tryton study. In patients with large SBs, periprocedural MI rate (10.5 %) was lower than in the provisional group in the TRYTON Pivotal trial (11.9 %). This result has met the non-inferiority primary endpoint.22 Although no study revealed explicit superiority of the Tryton SB stent over a simple technique with current-generation DES, one should keep in mind that the stent is a bare metal device. Further improvement in clinical outcomes should be expected once the Tryton SB stent is designed to be covered with a potent antiproliferative drug. While the provisional technique still remains a treatment of choice for bifurcation lesions, the use of complex two-stent strategy, with or without dedicated stents, may be a better option in cases in which an SB is large or diseased or if there is difficulty in accessing this vessel. Steigen TK, Maeng M, Wiseth R, et al. Randomized study on simple versus complex stenting of coronary artery bifurcation lesions: the Nordic bifurcation study. Circulation 2006;114:1955–61. Colombo A, Bramucci E, Saccà S, et al. Randomized study of the crush technique versus provisional side-branch stenting in true coronary bifurcations: the CACTUS (Coronary Bifurcations: Application of the Crushing Technique Using Sirolimus-Eluting Stents) Study. Circulation 2009;119:71–8. Hildick-Smith D, de Belder AJ, Cooter N, et al. Randomized trial of simple versus complex drug-eluting stenting for bifurcation lesions: the British Bifurcation Coronary Study: old, new, and evolving strategies. Circulation 2010;121: 1235–43. Chen SL, Santoso T, Zhang JJ, et al. A randomized clinical study comparing double kissing crush with provisional stenting for treatment of coronary bifurcation lesions: results from the DKCRUSH-II (Double Kissing Crush versus Provisional Stenting Technique for Treatment of Coronary Bifurcation Lesions) trial. J Am Coll Cardiol 2011;57:914–20. Costopoulos C, Latib A, Ferrarello S, et al. First- versus second-generation drug-eluting stents for the treatment of coronary bifurcations. Cardiovasc Revasc Med 2013;14:311–5. Lee JM, Hahn JY, Kang J, et al. Differential Prognostic Effect Between First- and Second-Generation Drug-Eluting Stents in Coronary Bifurcation Lesions: Patient-Level Analysis of the Korean Bifurcation Pooled Cohorts. JACC Cardiovasc Interv 2015;8:1318–31. Hildick-Smith D. A European bifurcation coronary study: a randomized comparison of provisional T-stenting versus a systematic 2-stent strategy in large caliber true bifurcations. Presented at: EuroPCR, Paris, France, 21 May 2015. Kumsars I. Randomized comparison of provisional sidebranch stenting versus a 2-stent strategy for treatment of true coronary bifurcation lesions involving a large side branch. 2-year results in the Nordic-Baltic Bifurcation Study IV. Presented at: EuroPCR, Paris, France, 21 May 2015. Généreux P, Kumsars I Lesiak M. A randomized trial of a dedicated bifurcation stent versus provisional stenting in the treatment of coronary bifurcation lesions. J Am Coll Cardiol 2015;65:533–43. Généreux P, Kini A, Lesiak M, et al. Outcomes of a dedicated stent in coronary bifurcations with large side branches: A subanalysis of the randomized TRYTON bifurcation study. Catheter Cardiovasc Interv 2016;87:1231–41. Ormiston JA, Webster MW, Ruygrok PN, et al. Stent deformation following simulated side-branch dilatation: a comparison of five stent designs. Catheter Cardiovasc Interv 1999;47:258–64. Ormiston JA, Currie E, Webster MW, et al. Drug-eluting stents for coronary bifurcations: insights into the crush technique. Catheter Cardiovasc Interv 2004;63:332–6. Louvard Y, Thomas M, Dzavik V, et al. 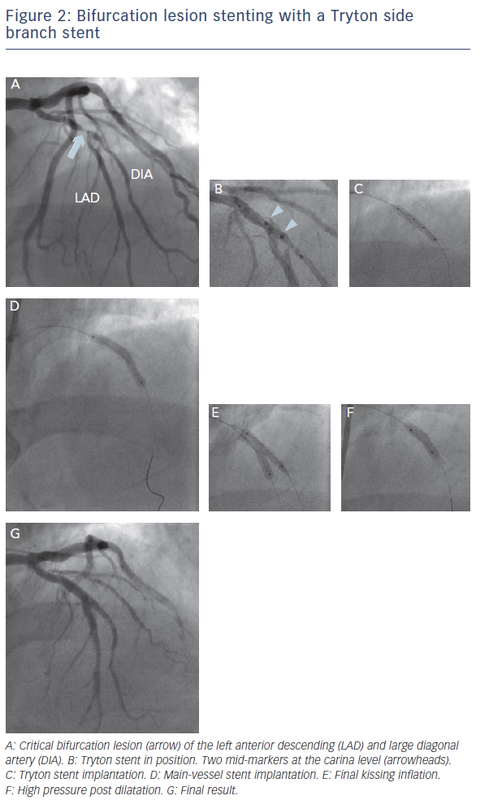 Classification of coronary artery bifurcation lesions and treatments: time for a consensus! Catheter Cardiovasc Interv 2008;71:175–83. Grube E, Buellesfeld L, Neumann FJ, et al. Six-month clinical and angiographic results of a dedicated drug-eluting stent for the treatment of coronary bifurcation narrowings. Am J Cardiol 2007;99:1691–7. Dubois C, Bennett J, Dens J, et al. COmplex coronary Bifurcation lesions: RAndomized comparison of a strategy using a dedicated self-expanding biolimus-eluting stent versus a culotte strategy using everolimus-eluting stents: primary results of the COBRA trial. EuroIntervention 2016;11:1457–67. Chan YH, Stella PR, Agostoni Pl. A “Simplified” culotte technique using two dedicated bifurcation stents and additional angiographic stent enhancement to treat a complex bifurcation lesion in non-ST segment elevation myocardial infarction with poor left ventricular function. Catheter Cardiovasc Interv 2015;85:E163–5. Gil RJ, Bil J, Džavík V, et al. Regular Drug-Eluting Stent vs Dedicated Coronary Bifurcation BiOSS Expert Stent: Multicenter Open-Label Randomized Controlled POLBOS I Trial. Can J Cardiol 2015;31:671–8. Gil RJ, Bil J, Grundeken MJ, et al. Regular drug-eluting stents versus the dedicated coronary bifurcation sirolimus-eluting BiOSS LIM® stent: the randomised, multicentre, open-label, controlled POLBOS II trial. EuroIntervention 2015;11:pii: 20140419-05. Gil RJ, Bil J, Grundeken MJ, et al. Long-term effectiveness and safety of the sirolimus-eluting BiOSS LIM® dedicated bifurcation stent in the treatment of distal left main stenosis: an international registry. EuroIntervention 2015;11:pii: 20150313-02. Grundeken MJ, Agostoni P, Lesiak M, et al. Placement of Tryton Side Branch Stent only; a new treatment strategy for Medina 0,0,1 coronary bifurcation lesions. Catheter Cardiovasc Interv 2013;82:E395–402. Agostoni P, Foley D, Lesiak M, et al. A prospective multicentre registry, evaluating real-world usage of the Tryton side branch stent: results of the E-Tryton 150/Benelux registry. EuroIntervention 2012;7:1293–300. Généreux P, Kumsars I, Schneider JE, et al. Dedicated Bifurcation Stent for the Treatment of Bifurcation Lesions Involving Large Side Branches. Outcomes From the Tryton Confirmatory Study. J Am Coll Cardiol Interv 2016;9:1338–46. Kassab GS, Bhatt DL, Lefèvre T, Louvard Y. Relation of angiographic side branch calibre to myocardial mass: a proof of concept myocardial infarct index. EuroIntervention 2013;8:1461–3. Lindsey JB, Kennedy KF, Stolker JM, et al. Prognostic implications of creatine kinase-MB elevation after percutaneous coronary intervention: results from the Evaluation of Drug-Eluting Stents and Ischemic Events (EVENT) registry. Circ Cardiovasc Interv 2011;4:474–80. Chen SL, Sheiban I, Xu B, Jepson N, et al. Impact of the complexity of bifurcation lesions treated with drug-eluting stents: the DEFINITION study (Definitions and impact of complEx biFurcation lesIons on clinical outcomes after percutaNeous coronary IntervenTIOn using drug-eluting steNts). JACC Cardiovasc Interv 2014;7:1266–76.